Otherworld Barbara, originally published between 2002 and 2005 in Japan and newly translated by Matt Thorn for Fantagraphics, is the kind of book that could hook an occasional manga reader into the world of Japanese comics for good. Dreamy, complex (but not incomprehensible) and eerie, it evokes Andrei Tarkovsky’s film Solaris and Lars von Trier’s miniseries The Kingdom in its atmospheric unfurling. 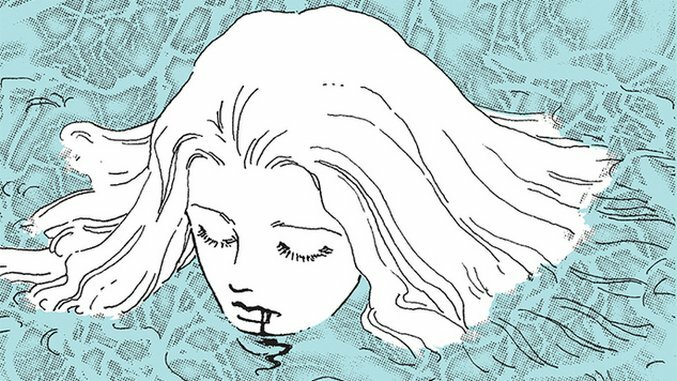 Hagio has cited sci-fi writer Ray Bradbury as an influence, and the combination of gentleness and teeth that marks his work is equally present here. The plot unfolds in chapters, each one revealing just enough of the underlying mystery to keep you reading. A beautiful young woman, Aoba, has lied in a coma since apparently killing her parents and eating their hearts. She never wakes, but she seems to manifest phenomena psychically, from mysterious sand to storm-level winds. A dream investigator, Watari, is called in to enter her mind and find out more about her case. As he does so, he finds her enmeshed in an alternate reality, still a child, on an island called Barbara. But is it real? And what does it have to do with Watari’s estranged son, Kiriya? The story is good, but its telling is also skillful. Hagio knows how to pull a veil aside slowly, pacing her narrative for maximum pay-off. Even when she seems to be digressing, she’s following a thread of the same tapestry, which becomes clear to the invested reader. Hagio innovates in her visuals, too. Her word balloons often crowd the page in scenes dense with information or intended to communicate stress. Sometimes they even overlap characters’ faces. She’s fond of pattern, including zip-a-tone-esque dots. The scenes set within Aoba’s dream, especially when she’s running free with her peers, are lighter, brighter, sparser in their line work, conveying an airiness, appropriate as many people on Barbara can fly. Transitions between worlds are done in shades of muted, soft gray. Areas of flat black scattered around the page feel like punctuation used for emotional effect. Some of these choices are the designer’s in the translation. A tabloid television news story, used to provide exposition, features text in a deliberately ugly, blocky font, outlined in white atop a negative rendering of a house. The dialogue can sound a little stilted, but the work’s grounding in dreams may mean that’s a deliberate choice. You might wake up from a dream remembering a strong image or an intense feeling, but it’s rare that they’re jam-packed with witty wordplay. So it is with Otherworld Barbara. It’s entirely possible that the conclusion, in Volume 2 (due out later), could fail to live up to the promise of what’s been woven so far, but the dream world Hagio has created will stay with you regardless.